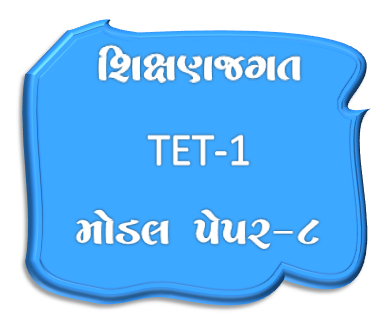 TET 1 exam Candidates have best option for Online preparation via our website www.rgejob. blogspot.in. This Site Is for Gujarati Competitive Exams Like GPSC,HTAT, Police,TET,Clerk,Bank etc...Preparation. On this site you will find lots of material for Exam Preparation in Gujarati, Hindi And also in English. Keep Visiting This Site Daily to Improve your Knowledge. Here Is Model Paper No.08 For Upcoming TET 1 exam 2018. This Is A practice paper for the candidates. This model paper is created by Job and Information team. 0 Response to "TET 1(Teacher Eligibility Test-1) Model Paper 8 By Shikshanjagat"